Meals on Wheels of Central Maryland is looking for volunteers to help deliver nutritious meals to homebound residents of Marble Hill/Upton. 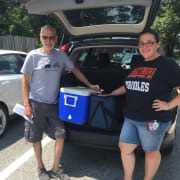 Volunteers pick up meals at Douglas Memorial Community Church, 1325 Madison Avenue, Baltimore, MD 21217, and deliver to apartment buildings and private residences in the local neighborhoods. We deliver Monday through Friday, 11am-12pm. Volunteers can help as little as once a month. Please e-mail volunteer@mowcm.org or call 443-573-0925 to learn more. You can make a difference in the life of a homebound neighbor!